Analytic bond-order potentials (BOPs) provide a way to compute atomistic properties with controllable accuracy. 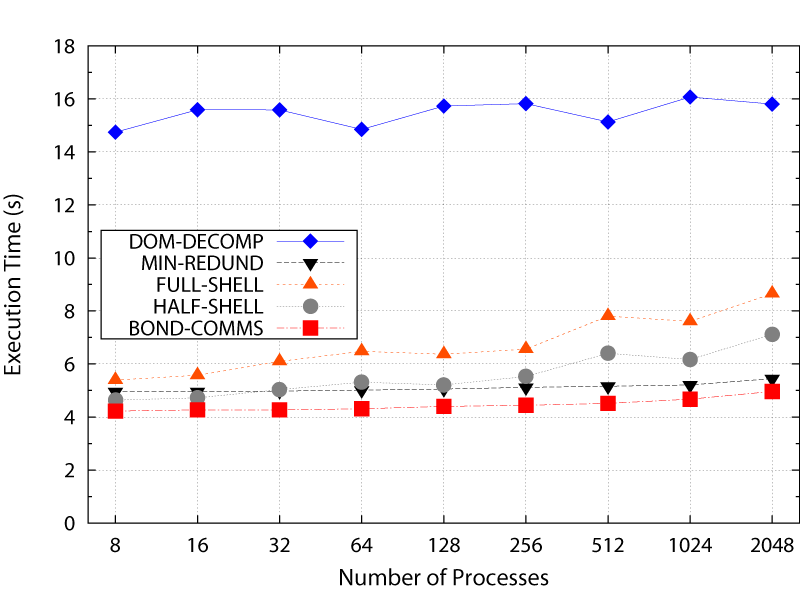 For large-scale computations of heterogeneous compounds at the atomistic level, both the computational efficiency and memory demand of BOP implementations have to be optimized. Since the evaluation of BOPs is a local operation within a finite environment, the parallelization concepts known from short-range interacting particle simulations can be applied to improve the performance of these simulations. In this work, several efficient parallelization methods for BOPs that use three-dimensional domain decomposition schemes are described. The schemes are implemented into the bond-order potential code BOPfox, and their performance is measured in a series of benchmarks. Systems of up to several millions of atoms are simulated on a high performance computing system, and parallel scaling is demonstrated for up to thousands of processors.